Here's the card I made, I wanted to create a little scene and I decided to use one of the new critters from Into the Woods (available late August) and a matching custom sentiment using Riley's ABCs. The DT girls have some amazing samples of one layers cards for you to inspire and I took some photos while making my card so you can see that you can achieve whatever you want for your one layer card just thinking ahead and going step by step. Always start stamping what you want to be on the top of your scene, in my case, the cute skunk. Then, mask it and stamp the next thing nearer and so on. 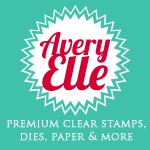 It's all about this, masking and stamping. For the background I cut a stripe of grass and used both the die cut and the negative cut, the first one when coloring the sky with Distress inks, the negative, masking the sky to color the grass. The last part was coloring the skunk with Copics, stamping the clouds, sentiment and hearts and drawing a stitching border with a pink marker. I hope you feel inspired by my little tutorial and play with us this time, I can't wait to see what you come up with! 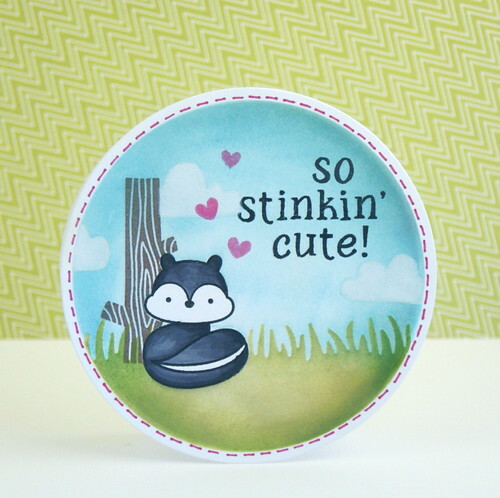 Your card is so stinkin' cute! Great tutorial, Yainea! OMG! Your card is so stinkin cute! I love OLCs. But I dont think I can compare myself to you. I'm very mediocre. Thanks to you, I am going to try something more compplicated this time around :) Love the way you've added so much details in a OLC. This is such a sweet card! Thanks for the tutorial! Yainea, this is gorgeous all the way! This is a adorable! I love this scene so much! Amazing job!